JERUSALEM (CNS) — U.S. Christian leaders expressed “grave concern” about the Trump administration’s decision to stop financial assistance to six East Jerusalem hospitals. Israeli doctors from most of Israel’s major hospitals called the decision a blow to the health of the city. The hospitals provide “invaluable medical care for the most vulnerable populations, including Palestinians living in East Jerusalem, Gaza and the West Bank,” the Christian leaders said in a Nov. 1 statement. It was issued jointly by the U.S. Conference of Catholic Bishops’ committees on International Justice and Peace and Ecumenical and Interreligious Affairs; the presiding bishop and conference of bishops of the Evangelical Lutheran Church in America; and the presiding bishop of the Episcopal Church on behalf of its House of Bishops. “We consider (the hospitals) integral parts of our common commitment to ministry in the Holy Land,” they said in the statement. President Donald Trump said his administration would cut $200 million of aid to medical and humanitarian aid providers. Earlier, he had announced that the U.S. would withhold $350 million from the U.N. Relief and Works Agency for Palestine Refugees in the Near East — amounting to more than one-quarter of the organization’s annual budget. The Lutheran Augusta Victoria Hospital, the Anglican St. John of Jerusalem Eye Hospital and Princess Basma Rehabilitation Centre, the Catholic St. Joseph Hospital, the Makassed Islamic Charitable Hospital, and the Red Crescent Maternity Hospital will be affected by the cuts. 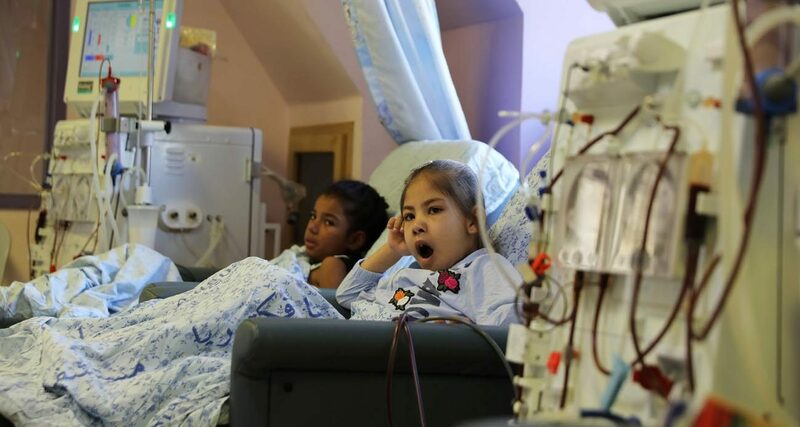 Ninety percent of the hospitals’ patients come with insurance from the Palestinian Authority, which has been unable to pay its full medical bills. The U.S. Congress approved $25 million for the financial year 2017 to be paid to the Palestinian Authority to help cover the bills of the patients from the West Bank. The European Union provides $15 million per year to cover payments. “In addition to being a morally correct thing to do, U.S. funding is key to paying pharmaceutical suppliers of medications, paying staff, and avoiding any interruption in the treatment of patients. We call on the president to restore this vital funding so that these patients will continue to receive the treatment and care they need,” the church leaders said. Hospitals are also having trouble paying for regular medications, he said. In a separate statement, Israeli doctors from most of Israel’s major hospitals called the decision a blow to the health of the city. “At the end of (the day), we confirm that it is the responsibility of the PA (to pay the debts), but the PA is really facing a severe financial situation since its establishment,” said Nammour. With other worldwide crisis in places such as Iraq, Yemen and Libya, international funding to Palestinians has shrunk, he said. “By the end of November, we won’t be able to procure the expensive chemotherapy treatments, and we won’t be able to accept patients who need to come in for chemotherapy,” he said.